In preparation for the summer season, the Club at Pradera underwent significant upgrades this past winter and spring. 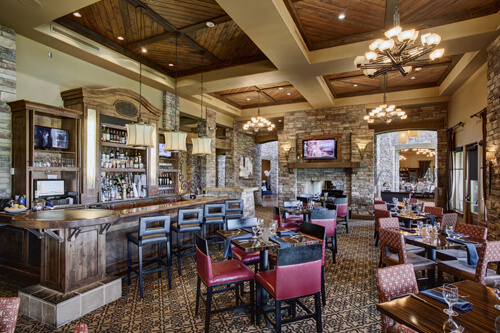 The clubhouse and grill were outfitted with brand-new furniture as well as new HDTV’s throughout. In addition, a community table has been added as a focal point in the lounge and has quickly become a popular gathering place for Club members. The outdoor seating area overlooking the 18th green and driving range was fitted with new teak furniture, additional HDTV’s, heaters, and shades that can be lowered during the cool weather months. All of the upgrades are focused on promoting one of the Club’s main missions: to create a beautiful, welcoming place that draws people together. At Pradera in Parker, new luxury homes are available priced from the $900’s. Many of the homesites back to either the Club at Pradera golf course or the extensive open space offered in this South Denver new home community. There are currently two homes available for quick move-in. Click here to discover more. To schedule a showing, contact Craig Penn via e-mail, or call 720.851.9411.